Amplifiers are the backbone of Analog electronics. They are used vastly in the field of electronics industry. Amplifiers are used almost in all the audio related applications. Power amplifier is the part of audio electronics. It is designed to maximize the magnitude of the power f given input signal. In sound electronics, the operational amplifier increases the voltage of the signal, but unable to provide the current, which is required to drive a load. In this tutorial, we will build a 25W Amplifier using TDA2040 Power Amplifier IC with an 4 Ohms impedance speaker connected to it. 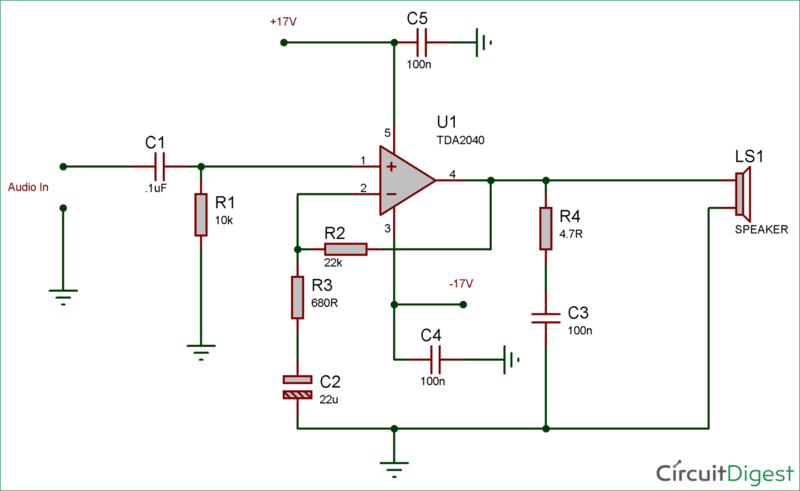 In our previous tutorials, we made 10Watt Amplifier using Op-amp and power transistor. But for this tutorial, we will build a 25W power amplifier which will drive a 4 Ohms impedance speaker. We will use specific power amplifier IC for this. We selected the TDA2040 power amplifier IC. If we see the graph, we can achieve more than 26Watt output power if we use a split power supply with more than 15V output. So, let’s make the power amplifier to work with 4 ohms impedance speaker at 25Watt without compromising the THD. 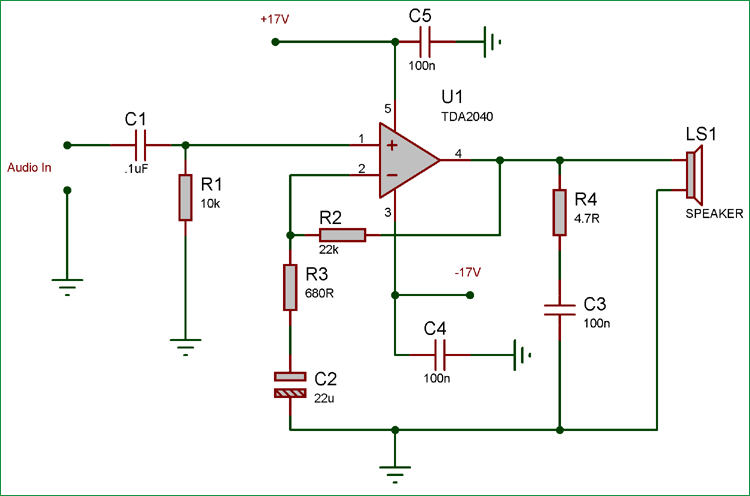 The schematic for 25 watt audio amplifier is pretty simple; The TDA2040 is amplifying the signal and providing 25Watt RMS wattage to the 4 ohms loudspeaker. C4 and C5 used as decoupling filter capacitor. C1 and R1 are acting as a filter. R2, R3 and C2 are providing the necessary feedback to the power amplifier. R4 and C3 are the snubber circuit to clamp the feedback from the inductive load (Loud Speaker). We are powering the circuit using +/-17V and the input sinusoidal signal is provided. The oscilloscope is connected across the output against 4 ohms load on channel A (Yellow) and the input signal is connected across channel B (Blue). We provided very Low-frequency sinusoidal signal of few 25-50Hz. As in low frequency, the amplifier will deliver more current to the load and the multimeter will be able to detect the AC voltage properly. When constructing the circuit, the Power amplifier TDA2040 needs to be connected with the heatsink properly. Larger heatsink provides a better result. Also, it is good to use audio grade rated box type capacitors for a better result. It is always a good choice to use PCB for Audio related application. The best way to construct the PCB is by referencing IC manufacturer guidelines. There is a reference PCB design provided in the datasheet of TDA2040. In the above image, a sample circuit with the PCB layout is shown. It is better to stick with the reference layout, and it is in a 1:1 ratio. It will decrease the noise coupling in output. Also, try to use 4 Ohms higher efficiency speaker with proper wattage to drive with this power amplifier.